I got this bag free from a friend so I write this review without thought of its cost. I travel by air extensively for work and have found this bag to be absolutely perfect for that purpose. The document sleeve is perfect for boarding passes & passports. The laptop compartment is easily accessible for security. The top carrying handle is comfortable and the shoulder straps and back padding are excellent. Internally it has plenty of compartments, including a handy CD-ROM sleeve for carrying media. In the laptop compartment there is a divider for separating folders. I've discovered that there is enough space on either side of the laptop to stow a small umbrella, which is VERY convenient. In the front compartment there are lots of sub-compartments for pens and other supplies. Frontmost there is a shallow but handy compartment that you can stow flat objects in (wallet, phone, reciepts, ID) quickly - also handy for security. On the side is a concealed bottle net that comes in very handy. On either side there is netting pockets that are basically for show - they are too small to serve any real purpose. There is a lumbar support pad on the lower back that unzips and holds a padded "brick" bag (for your laptop power supply). This is quite nice so that the brick does not dig into your back while carrying. My only gripe is that the top handle is too narrow to span my roll-on's handle and it has no strap for this purpose. I cross the shoulder straps and place them around the handle, which works fine. The bag is comfortable, useful, and thus far (on about 10K miles of air travel) has been durable - no breaks, tears or problems. Also notable that this bag fits under most seats on most commercial airlines - even the small aisle underseats in 737's, which means you can stow it there and not have to check your roll-on. HP Pavilion Notebook PC (DV5139US), screen size 15.4", ht 1.8", wdth 14.1", depth 10.4 ". The bag is for personal use, not business, and use will be moderate. She did want some extra compartments for organization. This case has met all her needs, it is light weight, constructed of durable material, well organized. Her notebook fits in this top loading case with ease. She is satisfied with this purchase. We would recommend purchasing this case. Love this bag! Clearly it was designed by someone who travels regularly because it has several airport-freindly features that are sadly lacking in similar products. - Handles fit into one another for comfortable carying even with small hands. - Well organized file/document area extends when fully unzipped for ease of use. - Rear sleave allows you to load the bag ontop of your rolling luggage securely. - Fantastic retracting passport & boarding pass sleeve is indespensible. - Well organized "workstation" space in front section with well thought out areas for BlackBerry, media, receipts, sticky notes, business cards, glasses, face wipes and everything else that I drag around. - The small pockets on either side arent very practical as they're too small to easily access. The perfect product for the professional. Not only the rolling case is great both in storage and functionality, but also TARGUS is a great company, I've owned an Easy roller for 3 years now and it withstand all the use and abuse that a frequent traveller can inflict to a Computer case, until finally the extensible handle broke (just the plastic grip) i've contacted targus in france took the case to their office, and in less than two weeks, no questions, no charges i've received at home a brand new one from the manufacturer. 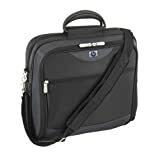 Excelente dise?o, bien construido, buenos materiales, se puede transportar con bastante comodidad, es perfecto para una portatil de 15.4" y queda espacio para cables, rat¨®n, documentos. Para viajar tiene un bolsillo para el pasaporte muy ¨²til,es un bolso bastante compacto, para su capacidad. I recently purchased the Targus Port 3.1 EasyRoller and I love it! I travel quite often and practically live with this roller and I couldn't be happier. Build quality is superb. Very well engineered. Nice zippers and a ton of useful storage space. 1. Resistente pero sin perder la est¨¦tica, otorgando seguridad al equipo en su interior. 2. C¨®modo, especialmente en aeropuertos, tener las manos libres es un valor que no tiene precio al momento de viajar. 3. Con capacidad para un laptop widescreen y todos sus accesorios, m¨¢s algunas cosas m¨¢s que suelo llevar en mis viajes de trabajo como c¨¢mara digital, algunas carpetas con documentos, cargador de mi tel¨¦fono celular, reproductor de mp3, etc. Definitivamente, este morral cumple con todos esos requisitos m¨¢s algunos bonos como son: el protector para pasaporte y boletos aereos, compartimiento secreto para el dinero, protector para CD, y montones de detalles m¨¢s que lo dejar¨¢n sorprendido. Si tiene alg¨²n defecto es que no es muy estable cuando se le coloca en el suelo y tiende a caerse sobre alguno de sus lados.